Fourteen people were killed and and 62 injured when the Mumbai-bound Matsyagandha Express derailed on Wednesday morning after hitting two boulders between Vir and Karanjadi stations near Ratnagiri in Maharashtra. The latest figures were released by the Konkan Railway authorities. Earlier, Union Railway Minister Laloo Prasad Yadav had said that 20 people were killed and 100 injured. The accident resulted in the locomotive and eight coaches of the train derailing from the tracks. This is the the second such accident in less than a year. Yadav expressed regret at the accident. He said an inquiry has been ordered into the mishap and his ministry will look at ways to prevent accidents due to inclement weather. The inquiry will be conducted by the Commissioner of Railway Safety, Western Railway. Yadav also announced an an ex-gratia payment of Rs 100,000 to the next of the kin of those killed and Rs 15,000 to the injured. The railway minister was rushing to the accident site along with Railway Board members to 'personally supervise the rescue and relief works'. He is expected to reach the site late evening. Laloo said, in case negligence was found to be the cause of the mishap, strict action would be taken against the guilty. "We want to see whether precautions had been taken in the area which is a remote hilly region," he said. He emphasised that safety of passengers was the top priority of his ministry. The railway minister said the train accident was a challenge to the ministry. "I accept this challenge to see that such accidents do not occur again," he said. Yadav also said a massive modernisation plan would be taken up soon to avert such accidents in the future. Asked whether a special budgetary allocation would be made in the forthcoming rail budget for this purpose, Yadav said, "There will not be shortage of funds". Yadav said he was waiting for a special plane from Delhi for going to Maharastra to visit the accident site as soon as possible. The accident occurred when the train, which was passing over a bridge, was hit by boulders dislodged due to heavy rains. The area is landslide prone. Patange said the locomotive of the train fell off bridge into the stream below. The accident occurred on a via duct and the question of passengers being swept away by water does not arise. The duct was at a height of 20-metres with dry land beneath, she said. Patange said 60 people have been hospitalised and local people were helping in the rescue operations. "If necessary army personnel will be pressed into service," she said. The injured have been taken to hospital in Mahad, 60 km from the accident site. The condition of the driver and the assistant driver of the ill-fated train was serious, railways sources said. hree trains have been diverted and as many cancelled, they said. Though Konkan Railway had provided netting all over the "vulnerable" area, there was no netting at the spot from where boulders are believed to have rolled down, Patange said. "This is a 10-metre depth cutting and usually such cuttings do not require a netting system," she said. Over 100 passengers were rescued from two coaches, which hung precariously over the bridge, sources said. The coaches were later removed. A rail engine has been rushed to the accident site from Mumbai to move the passengers to Karanjadi station from where they would proceed to Mumbai on buses, sources said. A large number of villagers rushed to the site after hearing a loud bang and began rescuing people trapped in the affected coaches before the official machinery got into action. The injured were rushed to hospitals in Mahad and Raha. Ganpathi (all from Gokran) and Mohammad Sadu from Udupi in Karnataka. Maharashtra Chief Minister Sushilkumar Shinde will leave for the accident site later in the day. State Health Minister Digvijay Khanvilkar has already rushed to the spot. Chairman of Railways Board R K Singh, to a question on the possibility of a sabotage, said in Kolkata, "It would not be right to rush to any conclusion but heavy rain could be one of the factors as boulders get displaced during rainy season." Who cares about rail safety? KR sources said some of the injured passengers of the 2620-UP Mangalore-Mumbai train are being brought to Mumbai for treatment. Konkan Railway General Manager Raja Ram told rediff.com that the accident took place due to the incessant rains, which hampered visibility. Rescue operations are in progress, he said. The accident site is about 60 kms from Roha and around 200 kilometres from Mumbai, he added. 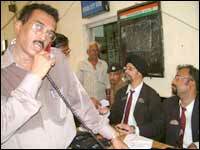 Konkan Railways Controller Baban Ghatge said a relief train has left for Raigad from Goa. A medical van has reached the site and medical aid is being provided to the victims. A rail engine has been rushed to the accident site from Mumbai to move the passengers to Karanjadi station from where they would proceed to Mumbai on buses, the Konkan Railway sources said. Ten ambulances have been pressed into service and help of local doctors is being taken to provide medical aid to the injured, they said. Last year nearly 50 people were killed after boulders hit a train following heavy rains near Ratnagiri in Maharashtra.